Elysian Fields are coming to California! Check the tours page for dates (or get in touch). The new Elysian Fields album Pink Air has been released in the US and Europe, and the band has a new video to share with you, directed by Lance Scott Walker. This week the band embarks on a monthlong tour of Europe, with stops in France, Germany, Czech Republic, and Poland. See the tours page. 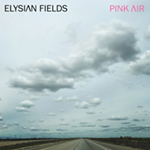 We are thrilled to announce the new Elysian Fields album Pink Air, to be released 21 September (US) and 28 September (EU). The 11-song album is a post-apocalyptic rock & roll joyride, and will be released by Ojet in the States and by Microcultures Records in France. Watch this space! Tour dates are being confirmed and singles from the album (with a preorder link) are coming soon. Meanwhile, Jennifer will be one of the special guests in the New York City premiere of Hal Willner's Amarcord Nino Rota on Friday, July 27 (7:30 pm) at the Lincoln Center's Damrosch Park. Reserve TICKETS! From the Lincoln Center web site: Legendary music producer Hal Willner brings together an eclectic array of musicians for an imaginative musical tribute to Italian composer Nino Rota, known for his iconic scores to Federico Fellini's films including La Dolce Vita, 8 1/2, and Juliet of the Spirits. The night opens with music from two other famous Rota scores—the first two Godfather movies—before digging into the Fellini music with a live performance of the seminal 1981 tribute album that launched Willner's storied career, Amarcord Nino Rota (I Remember Nino Rota). Jennifer will make a special guest appearance in the Dr. Octagon/Handsome Boy Modeling School show on Thursday, April 5 at Brooklyn Bowl. Elysian Fields have finished a new album to be released in the second half of 2018. Stay tuned. Meanwhile, Jennifer and Oren (along with drummer Chris Vatalaro) recently contributed a track to the compilation Vanity Of Vanities--A Tribute To Connie Converse, released this month on John Zorn's Tzadik label. They are joined on the compilation by the likes of Karen O, Jeff Tweedy, Big Thief, Mike Patton, and Laurie Anderson, with everyone chipping in a unique take on this lost songwriter's catalog. Elysian Fields work their magic on "Man In The Sky." From the Tzadik site: Connie Converse was a remarkable composer who worked in the 1950s and 1960s. By 1974, depressed over her lack of recognition and success, she packed up her belongings and drove off never to be heard of again. Little known in her lifetime, she is now viewed as a pioneer of the modern singer/songwriter genre. This exciting compilation collects fifteen of her most unique and soulful songs performed by an all-star group of contemporary singer/songwriters. Featuring an informative essay by musician and Converse scholar David Garland, Vanity of Vanities is a heartfelt tribute to one of the unsung heroes of contemporary songwriting. Vanity Of Vanities can be purchased directly from the Tzadik site. You can also purchase the album from Amazon. Elysian Fields contributed a track to English post-punk band The The's Radio Cineola: Trilogy box set, which can be ordered here. The duo recorded "Gravitate To Me" from The The's 1989 album Mind Bomb. La Mar Enfortuna (Jennifer Charles and Oren Bloedow) are making a rare appearance this fall at The Jewish Museum in New York City. The sephardic group will perform on Thursday, November 9 (7:30 – 9 pm) at Scheuer Auditorium in a concert presented by Bang On A Can. Get [TICKETS]. Jennifer and Oren spent a fruitful summer finishing up the writing for their next record. Elysian Fields go into the studio the end of August in upstate New York to begin recording for the new album! In case you missed it, the opera Jennifer starred in last year won the 2017 Pulitzer Prize for music. The opera — Du Yun's 'Angel's Bone' — was called "an appallingly good work" by The New York Times. Over the summer, Jennifer, along with the rest of the cast, recorded this original opera, which comes out October 7 on VIA Records. Jennifer collaborated with her old Lovage running buddy Dan The Automator to make this breezy summer tune, which debuts as an Amazon Music Original today (6/23). You can purchase or stream Nathaniel Merriweather's "Summer Lovin (feat. Jennifer Charles)" HERE and read about it in VIBE and MXDWN. The Pulitzer prize goes to Du Yun's Angel's Bone. Jennifer starred as the girl angel, in Du Yun's epic opera about two angels that fall to earth (a fable about human trafficking). Jennifer is thrilled for Du Yun, and proud to have originated this unusual role. Here is Spin Magazine's take: "The Pulitzer Prize Winner for Music Is an Ambitious, Punk-Influenced Opera About Human Trafficking"
Elysian Fields has a new video! "The Animals Know" is the third video from Ghosts Of No and the second from director/illustrator Steven Mertens (who also created the video for "Channeling" in 2014). Jennifer guest spots on the debut album by Tredici Bacci, co-writing and singing on "Drowned." Tredici Bacci is the project of musician and composer Simon Hanes that channels his love of '60s/'70s soundtrack music, tipping his hat especially to Italy and the likes of Ennio Morricone and Bruno Nicolai. The group's new album, Amore Per Tutti, is out via NNA Tapes, and you can hear it here. Coinciding with the release of Ghosts of No is the video for its closing track "Shadow Of The Living Light," shot by Lance Scott Walker in the Mojave Desert. 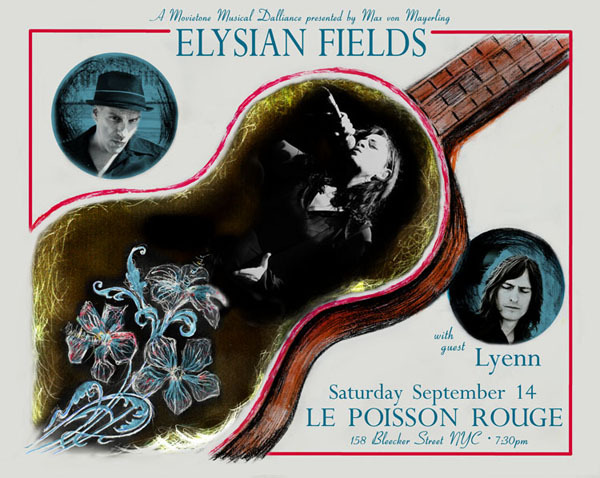 Elysian Fields celebrate the 20th anniversary of the band with a retrospective concert series at the new Brooklyn music space The Owl Music Parlor, along with one show at their home base in recent years, Le Poisson Rouge. Each of the concerts will feature an Elysian Fields album played in its entirety, and you can expect many of their longstanding collaborators and cohorts to appear every night. . 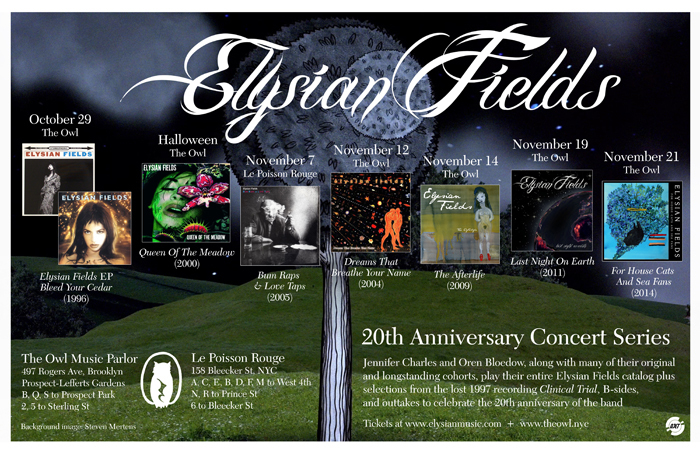 This year marks the 20th anniversary of Elysian Fields. Be on the lookout for special shows in New York in summer/fall 2015. There are new shirts and colors in the shop! Oren and Jennifer are hard at work creating music for Parisian dance company Affari Esteri's latest work "Guerrieri e Amorosi," which debuts in early 2015. Very soon to premiere is the first video created for the new album by Steven Mertens, for the song "Channeling." The band is just beside themselves with excitement to soon share this with the world. EF will make a trip into Massachusetts on August 16th to play MASS MoCA. You can purchase tickets online in advance here. 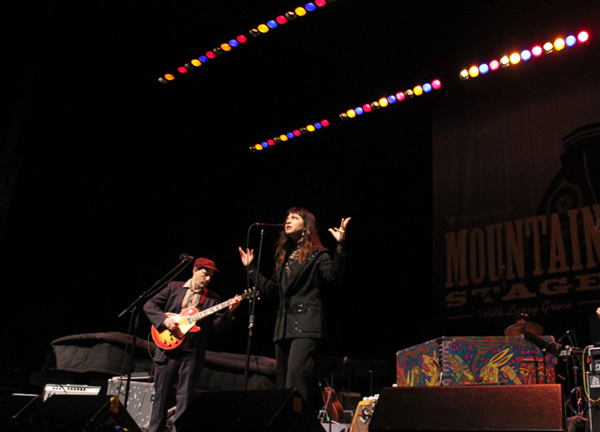 Elysian Fields will perform live on Irene Trudel's show on WFMU, on Monday, June 2 at noon. Elysian Fields is in Europe! See the tours page for dates. On Thursday, April 3 at 2:30pm EST and 8:30pm in Paris, the band will do a live broadcast from Radio France's Studio 105, presented by FIP Live. Listen here! Jennifer will be playing with Marc Ribot's Ceramic Dog, alongside David Byrne, John McCrea, Mike Mills, Jason Moran, and others. This a free event! Join music makers and music lovers alike in urging Congress to support artists' pay for radio play. 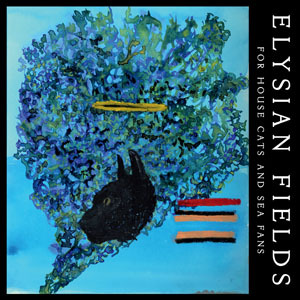 Elysian Fields will release a new album, For House Cats And Sea Fans, on February 24 in Europe (Vicious Circle) and on March 21 in the US (Diluvian/Ojet). Guests include James Chance, JG Thirlwell, and John Medeski. The cover was painted by John Lurie. The band will embark on a European tour in late March and will visit France, Belgium, Switzerland, and Germany. Check out the tours page for dates. Stream the first single from the album, "Alms For Your Love," here. Pre-order the album in the EU here. Supporting is Belgian act Lyenn. The show starts at 7:30pm. Elysian Fields will perform on Wednesday, August 14 as part of the Socrates Sculpture Park Outdoor Cinema series. 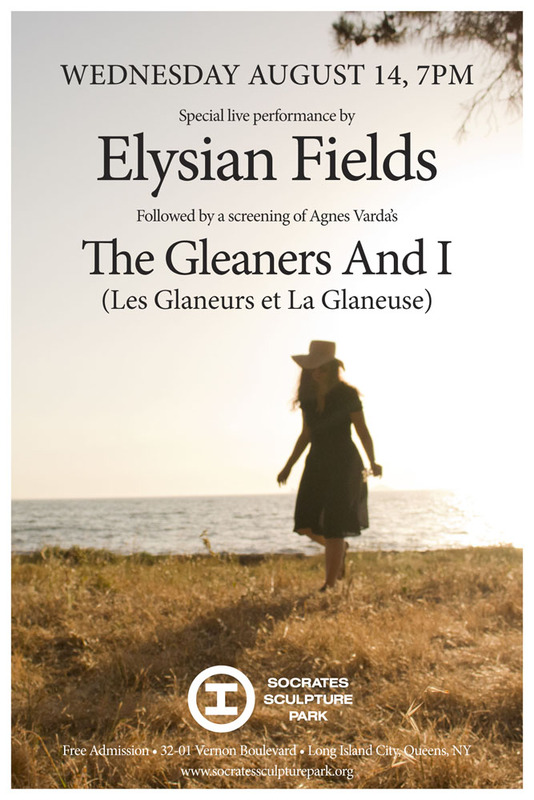 They will perform in front of the screen before a screening of Agnes Varda's The Gleaners And I.
Jennifer and Oren will be accompanied by Hagar Ben Ari (bass) and longtime collaborator Matt Johnson (drums). The show starts at 7pm and is free of charge. Bring a blanket and sit on the grass!